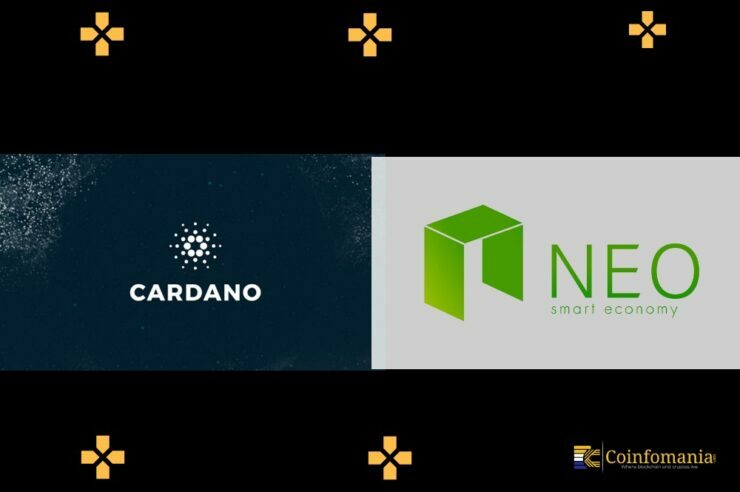 Cardano vs. NEO: The Game of Blockchains and Smart Contracts - Coinfomania Coinfomania: Where blockchain and cryptos live. One thing that makes the cryptocurrency and blockchain industry interesting for investors and enthusiasts is the battle for supremacy among various smart contract projects, which is being led by Vitalik Buterin’s Ethereum. While the ecosystem continues to be a significant player, other smart contract platforms are on the rise, and even threatening to dethrone Ethereum. In this article, we’ll compare two of the most promising projects that fall into this category. It’s Cardano Vs. NEO. Cardano, also often called “Japan’s Ethereum,” is a third generation blockchain that aims to supersede other smart contract platforms by improving on their flaws such as scalability and security. Cardano’s biggest goal is to give users the opportunity to create smart contracts, build decentralized Applications (dApps), and make unlimited, fast and free transactions, with the use of its native cryptocurrency ADA. While the Cardano blockchain initially started operations in 2015, it was officially launched on Sept 29, 2017. Interestingly, Charles Hoskinson, former CEO and Co-founder of the Ethereum Blockchain, is the founder of Cardano. The project has a solid team that consists of three separate entities namely: Cardano Foundation, a non-profit organization based in Switzerland whose responsibility is to promote the project around the world; Emurgo, a Japanese company that develops, integrates, and supports startups that want to adopt the Cardano blockchain; and Input Output Hong Kong (IOHK), a decentralized engineering company that creates cryptocurrencies and blockchains for institutions and corporations. IOHK is on a contract to build and maintain the Cardano ecosystem until 2020. NEO, which is formally known as AntShares until 2017 is a Greek word for “new” and “young.” While Cardano has a connection with Japan, NEO is popularly known as the “Ethereum of China” because of its Chinese roots. Since its rebranding in June 2017, NEO has taken the smart world by storm with its explosive growth. The NEO ecosystem was created by OnChain, a Shanghai-based blockchain development company founded by Da Hongfei. The NEO team includes Zhang Zhengwen the founder and core developer, Da Hongfei, Tao Rongq, and a host of other veteran developers and professional. NEO’s primary objective is to create an open source platform that allows for the digitization and management of physical assets on the blockchain with the help of smart contracts and decentralized applications. In other words, users can create, identify, manage, and trade their digital assets on the ecosystem. The NEO ecosystem has two official tokens: GAS and NEO. While NEO tokens are used for the creation of blocks and management of the ecosystem, the GAS tokens give users the right to use or transact on the NEO platform. Haskell programming language for quicker lead times. Daedalus Wallet: designed with advanced cryptography for securing users assets. Governance by ADA holders: allows token holders to participate in the management of the ecosystem. Research-driven approach: Unlike many other blockchain projects, Cardano was created with a research-driven approach. NeoX: this is used for a cross-chain asset exchange and distribution. NeoQ: this is a security protection system that prevents hacking attempts. DBFT: helps to improve scalability and performance. Neo Contract: used for executing smart contracts. Both blockchain projects have a promising future backed by active teams of qualified programmers and scientists. Cardano is busy working to achieve its goals through the implementation of optimized block storage, Cardano rust project, open ouroboros delegation implementation, human-friendly addresses, etc. NEO, on the other hand, plans to achieve network decentralization in 2019. In the end, Cardano and NEO are interesting projects that will make significant impacts on the blockchain industry and the world at large.